If you had to make a list of your four most important things, tangible or intangible, what would they be? This is the question panelist Sarah Faulx posed to 40 audience members Friday night in William Pitt Union Dining Room B. After encouraging them to take out their phones and make the list, she said to imagine America is in crisis, and to then delete one item from the list. The audience members deleted each item until only one remained. Faulx then said to imagine having to flee the country and to imagine how dear the last item becomes — whether it be friends, family, education or security. This activity intended to help the audience understand the gravity of the panel’s discussion topic — mental health in the refugee community. The panel, which the student club Facilitating Opportunities for Refugee Growth and Empowerment put together, included three speakers — Faulx, Ashok Gurung and Gemma Marolda — who all discussed refugee mental health. Caroline Smith, a junior international and area studies and political science double major, is the co-president of FORGE. She said FORGE hosts two events each year outside of their general body meetings, including a fall panel, which is typically related to political issues. “I was like ‘what can we focus on that would be interesting to our organization members, because most of them aren’t poli-sci majors?’ Most of them are biological science majors, so I thought that it would be really interesting to do it from a mental health perspective,” Smith said. Marolda, a Pitt political science professor, gave background information about international immigration to preface the discussion. She said immigration shouldn’t have a negative connotation because it moves the global economy — and the pushback against globalization is rooted in fear. “The greater the flow of migration, the greater the risk that you are going to lose your identity,” Marolda said. Faulx, a licensed clinical social worker of Highland Park, followed Marolda and spoke about her work helping refugee kids work through their trauma. “Refugees have to make huge sacrifices for safety and for loved ones,” Faulx said. Faulx said sacrifices and traumatic experiences — such as undergoing persecution, fleeing one’s home country and being placed in a completely different culture — are emotionally scarring and can trigger mental illness such as anxiety, depression and post-traumatic stress disorder. According to the Refugee Health Technical Assistance Center, studies have shown the PTSD rate in settled refugees to be 10 to 40 percent in adults and 50 to 90 percent in children, compared to about 8 percent of American adults and about 5 percent of American children. Faulx said refugee trauma can be especially damaging to teenagers as their brains are still developing. “Sometimes it takes a long time before kids will start to talk and discuss their journey and maybe a traumatic experience, so having that opportunity [to listen], I feel very fortunate for that,” Faulx said. One method she uses when counseling refugee children is called “sand tray” therapy — a therapy technique in which the child creates scenes and plays with toys in the sand. How children play and what they create gives Faulx insight into what trauma they’ve gone through, and the tactile play is also therapeutic. 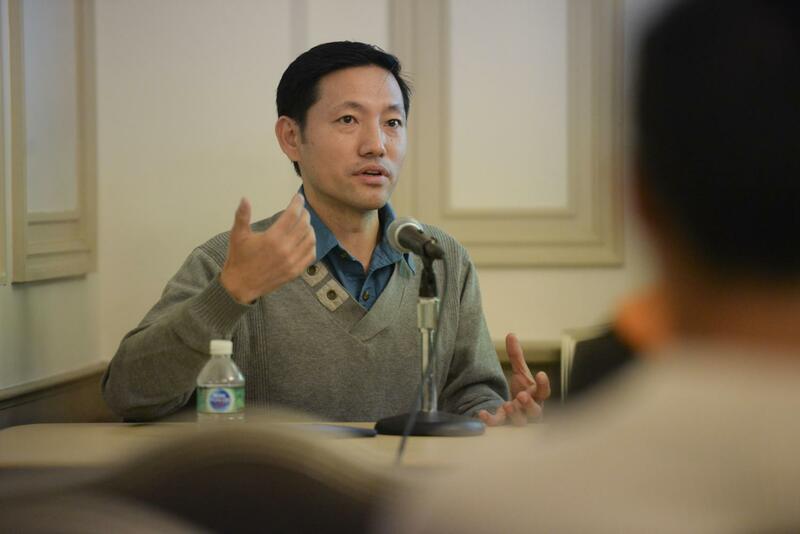 Gurung, the final panel member a Pitt alum, was a child refugee himself. After his father was jailed for speaking up for human rights, Gurung fled his home in Bhutan at age 9. He said being a refugee was high-stress, especially with the poor conditions of the different refugee camps in Nepal he lived in for three years. He said he even became sick a few times because his stress levels were so high he was unable to adequately digest food. Gurung — a co-founder of the Bhutanese Community Association of Pittsburgh — has recovered with the help of medical treatment, meditation and yoga, and he now works with Bhutanese refugees in Pittsburgh. He said he wanted to shed light on the refugee troubles that are sometimes overlooked, such as mental health. Smith said it’s important to remember refugees need more than just basic necessities like food, water, a house and a job. “Vulnerable groups are even more vulnerable to these kinds of [mental health problems]. Every step for them is just gonna be 10 times harder than someone who is born here,” Smith said. Smith also said President Donald Trump’s refugee policies will have a negative impact on refugee mental health. Trump plans to cap refugee admission at 45,000 next year, a historically low number, the Wall Street Journal reported in September. Faulx said it’s important for refugee children — and all children — to get information on mental health, specifically through school. “That’s part of who they are as a human as well as their physical needs, to be cared for and taken care of, and this [mental health] issue needs to be addressed as well, just like your physical health,” Faulx said. The mental health aspect of the panel attracted some audience members, including Cameron Hoffman, a junior history and political science double major. He said he frequently discusses refugees in his classes, but often in a different context. “We’ve talked a lot about the numbers and the political aspects of it. We haven’t talked too much about the psychological issues that those refugees have, so I thought it would be pretty interesting to learn that aspect as well,” Hoffman said. Marolda said refugee health is important because refugees are ultimately seeking a better life. “We need to care because these are human beings just like you and me,” Marolda said.